New Hampshire will never be mistaken as the Sunshine State, but the Granite State is well-positioned to join in the global solar power movement. 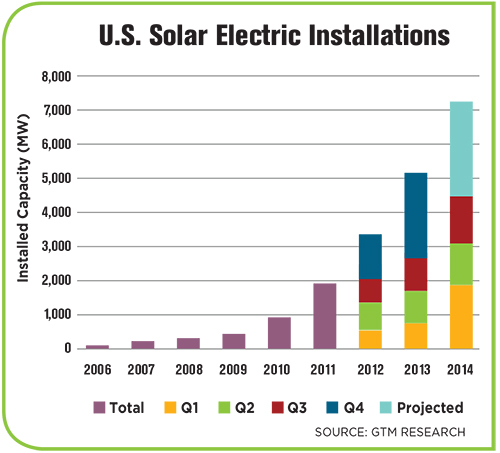 In the U.S. alone, the solar market has exploded over the past five years, growing from less than 500 megawatts of installed capacity in 2009 to over 7,000 MW today. The Solar Energy Industry Association ranks New Hampshire 32nd in the use of solar power in the U.S., an indication of a large untapped potential for solar in the state. Many don’t realize that New Hampshire also has a viable solar resource. In fact, New Hampshire gets roughly 20 percent more annual sunshine than Germany, the world leader in solar energy installations. Here are a few of the main reasons New Hampshire should implement more solar programs. • Profitable land use: New Hampshire has a considerable amount of rural land that could be used for large-scale, ground-mounted solar development projects. Solar development is also often the highest-and-best use of a contaminated site or closed landfill property. Redeveloping these underutilized properties effectively converts a liability into an asset. Frequently, these revenue-generating solar assets are also new sources of tax revenue. In fact, some solar host municipalities in Massachusetts have suggested that solar power projects are the most viable industry in their current tax base. Compared to other types of power plants, solar power projects are relatively low-impact projects. They typically produce no noise, no emissions, no pollution and no traffic. If necessary, a solar array can be screened by fences or vegetative barriers to minimize visual impacts from neighboring properties. • Energy independence: Generating domestic solar power in New Hampshire reduces the need for power generated by other fuel sources, including imported natural gas and oil. In fact, New Hampshire spends approximately $4 billion per year on energy generated by imported fossil fuel (or 66 percent of all energy). A diverse energy mix, including independent sources like solar, would give New Hampshire more control over long-term energy supply and costs. • Energy security: Solar is typically distributed generation (or DG), which refers to power generation at the point of consumption. Generating power on-site, rather than centrally, eliminates the cost, complexity, interdependencies and inefficiencies associated with transmission and distribution. DG facilities, including commercial-scale solar PV projects, can provide a backup to the current New Hampshire grid system, which is made up mostly of a few centrally located, utility-scale power plants. Not only are they inefficient, but these traditional grid systems are susceptible to major power outages. Many of these utility-scale power plants also rely heavily on computer automation and are vulnerable to a potential cyber attack. With the development of more distributed generation facilities and “micro-grid” systems (connecting generation and users at a local level), power can be a big part of New Hampshire’s long-term energy security plan. • Price stability: Based on recent filings with the NH Public Utilities Commission, Unitil, Liberty Utilities and the NH Electric Co-op are projecting rate hikes of 29 percent to 50 percent in 2015, increases that are due to a combination of constraints in the natural gas supply and regional shortages of electricity generation. In addition, the price of solar modules has dropped over 80 percent since 2008, which has made solar a cost-effective option almost anywhere. In a third-party ownership model, a solar power “off-taker” can enter into a long-term power-purchase-agreement with a solar project owner at a fixed rate, providing cost certainty in a market that is currently experiencing annual fluctuations of up to 50 percent. Electricity-users in New Hampshire should invest in solar power projects to both realize a short-term payback and as a hedge to rising utility prices. The time has come for municipalities, institutions, businesses and individuals in New Hampshire to embrace solar power as part of their energy mix. Several organizations in New Hampshire are trying to build momentum for solar projects and policy, including the NH Clean Tech Council and the NH Community Development Finance Authority. They recognize that an investment in solar today will yield many long-term benefits for the state. Max Lamson is Senior Project Manager for Kennedy/Jenks Consultants.